Corn, herbs, and dainty little pasta, tossed in a light and simple lemon vinaigrette. 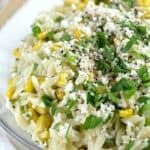 With spring happening, this very easy, VERY delicious, lovely Lemony Orzo and Roasted Corn Salad is just what we need. Happy spring! Yesss, it is here. …and know what else is here? MY birthday. My 45th birthday actually. Holy hell, I turn 45 tomorrow. Oyyyy. There are those birthdays we struggle with more than others, aren’t there? I struggle with the fives …I didn’t like turning 25 because 21-25 you are finally old enough, and still young enough, to do pretty much anything without all the strings of responsibility or body aches to go with. Turning 35 sucked because there are 2 classes of women on every medical form ever made – those under 35 and those over 35. And now I’m looking at 45 and I am ok with it (the 40s are proving to be SO better than the 30s. By far), but I am kinda feeling like this is my last birthday before I am officially old. Because the next one will be 50. And I know, I know, I know, you are only as old you feel and what not. And I am doing well for my age and all, I know. But still. It is humbling. And it is making me want to do more, enjoy more, plan more. See, I have always had something big that I have been working toward. In my 20s, I got a PhD. In my 30s, I was in the Army, had a kid, one marriage ended, changed careers, another marriage began, and I had another kid. (Busy decade) …So far in my 40s, I had both knees reconstructed, started doing triathlons, and finished an Ironman. And I started this blog. So what next???? Ahhaa yes, I have figured that out. But it is a bit of left field and random that I am not going to share it now. But I will say that before I am 50 I want to travel to someplace amazing. Someplace exotic, on the other side of the world. And I will, for now, leave it at that. In the meantime, happy birthday to me and let’s keep on with the food shall we? That is why we are here anyway. 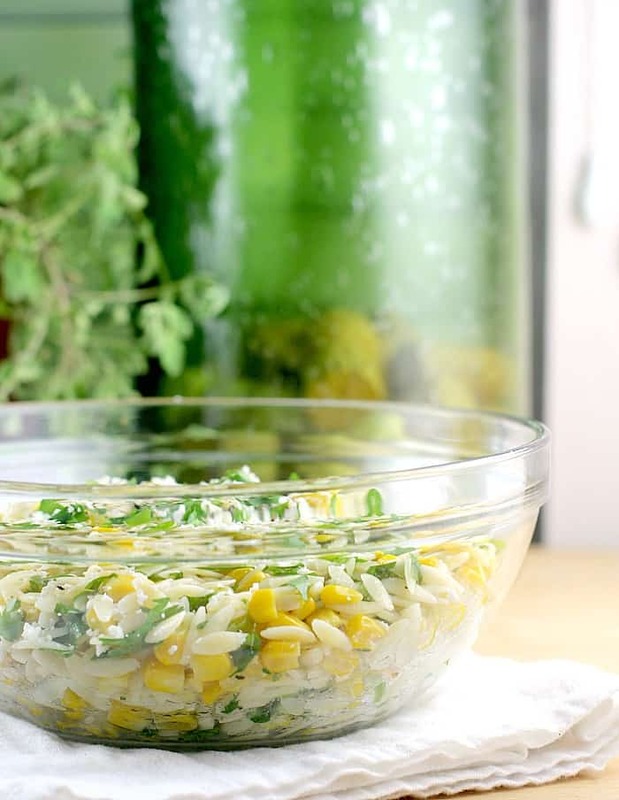 …and there is not too much to say about this Lemony Orzo and Roasted Corn Salad anyway. It is simple, rustic but at the same time elegant. This recipe is completely dependent on the quality of ingredients you use to. Fresh lemons, crisp herbs and green onion, kosher salt, fresh cracked pepper, and, most importantly, and nice good quality, fruity extra virgin olive oil. These are the keys to success with any recipe like this because there is no hiding. The simple ingredients are what they are, with no frills. 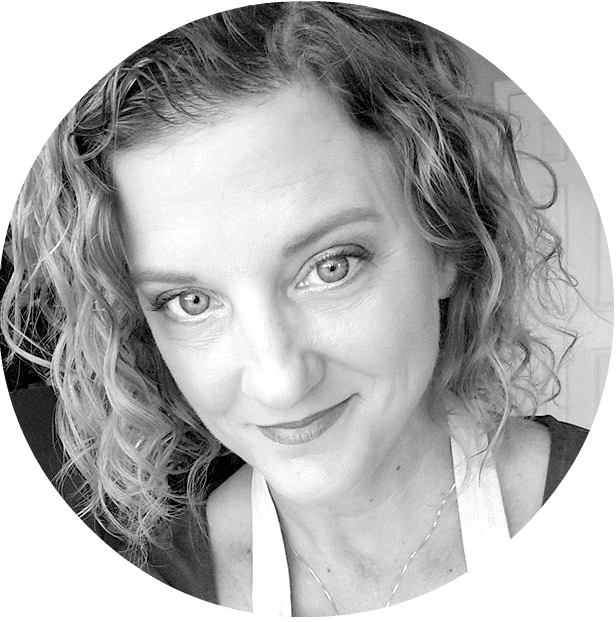 So, let’s channel our inner Barefoot Contessa and appreciate that, for some recipes, the ingredients really need to be the best you can find. But I couldn’t find fresh corn, so I used frozen. Life has its limitations. So that’s it guys. 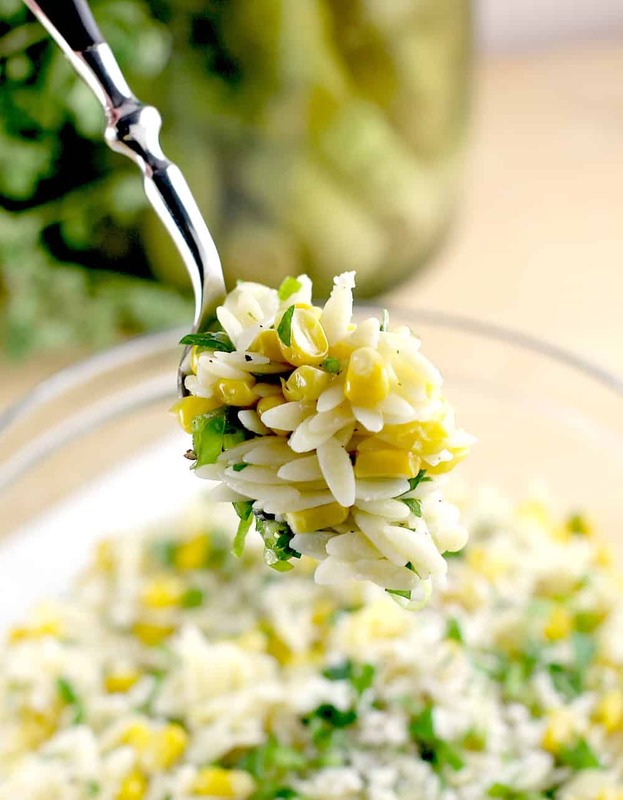 A fresh Lemony Orzo and Roasted Corn Salad side for all your spring needs. With some pre-birthday, oh-EM-gee thoughts to go with. Enjoy and Happy Spring! Heat the oven broiler on high. Bring a large pot of water to a boil. In the pot of water, cook the orzo according to package directions and drain. 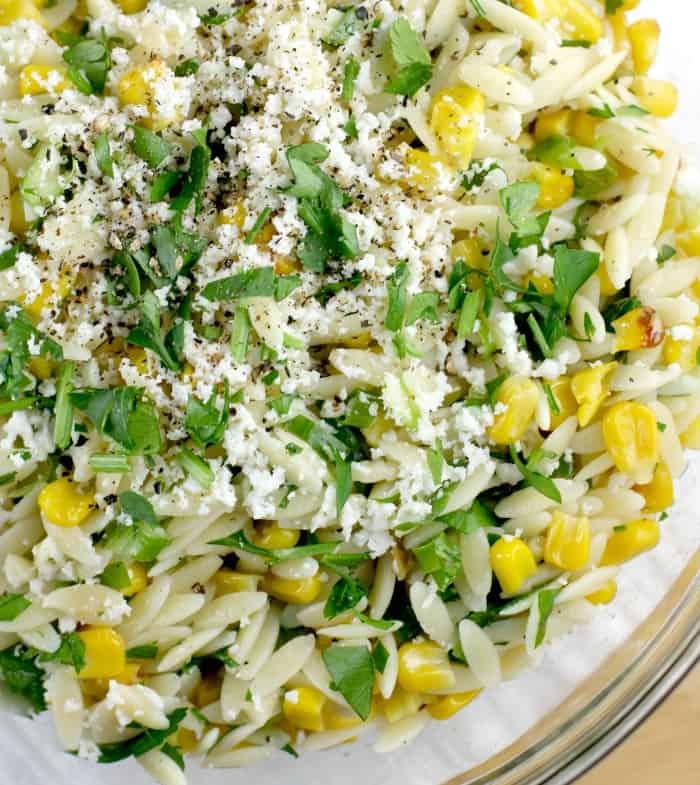 While orzo is cooking, toss the corn in the olive oil and layer on a rimmed bake sheet. Broil until golden, stirring regularly. Remove from the oven and set aside. 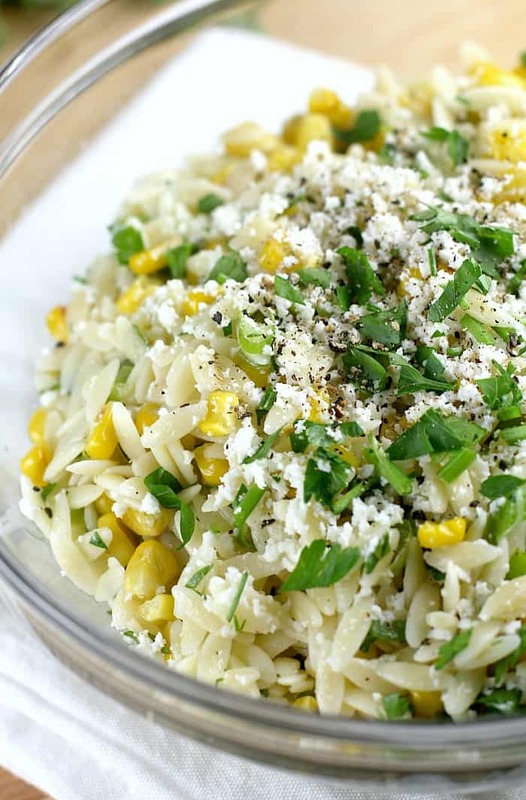 In a large bowl, toss the orzo, corn, parsley, and green onion. Toss in the vinaigrette. Taste for seasoning and add more salt as necessary. Garnish with cheese, parsley, and pepper. Serve. Yields: 4 servings. Leave me a comment! Otherwise, I’m just talking to myself here …do you embrace birthday milestones? This looks delicious! I love anything with lemon. I’m a true lemonoholic! Can’t wait to try this recipe! This looks yummy! Would be a perfect side dish for a BBQ – some grilled chicken will pair well with it! I’ve never tried Orzo before but definitely want to try this recipe maybe with some mushrooms too because I love them LOL! This definitely screams spring to me! I love orzo too it’s so quick to make. Beautiful recipe AND all things get better with age, wine and cheese to name a few! Oh my goodness!!! Everything about this sounds and looks soooo delightful!!! First of all, your pictures are BEAUTIFUL. So precise and crystal clear. On a second note, this looks absolutely delicious. I have never tried salad like this, but it look so refreshing! love the brightness in this dish. I can see myself eating this with a little grilled chicken on top! The colors in this dish are lovely. I think that this would make a wonderful side dish. Hello spring and happy birthday! I bet the corn in this salad is wonderfully sweet! Perfect salad to bring on a picnic! I think I only ever struggled with turning 30. After that, I just conveniently forgot how old I was getting lol. Happy birthday! This salad looks amazing. I keep going back to that first shot up on top, it looks like an orzo sun! So bright and fresh. Perfect for the warmer days ahead. This would be such an awesome side dish! I love everything in it! This looks wonderful! I love light springy dishes like this..the lemon and sweet corn is a perfect combo. Beautiful photos and happy belated birthday dear! This sounds like such a tasty side! I love making orzo, it’s so simple, yet tasty!